more information regarding the sale. Today we received a note from Georges Claeys stating that he is selling his private collection of minerals from Mont Saint-Hilaire, Québec—about 400 pieces. The collection contains micromounts, cabinet specimens, handpieces, and two big museum pieces: a siderite and an analcime with aegerine. Some pieces are published in the German magazine Lapis with the theme Mont Saint-Hilaire, Quebec, Canada. 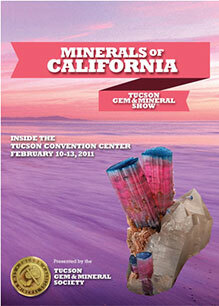 In 2006, some of Claeys's best pieces were exhibited at the Tucson Gem and Mineral Show in the featured Canadian exhibition. A list of seminars was released just as our newsletter went to e-press. 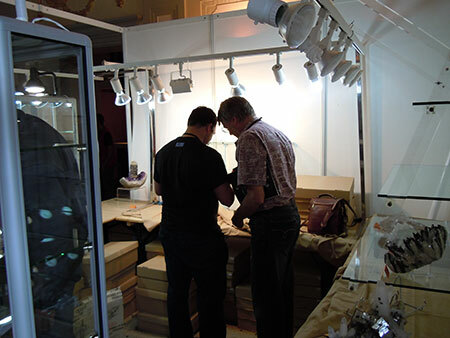 Tucson 2010 was well documented by BlueCap with a 3-DVD set, What’s Hot in Tucson, devoted to minerals and a separate DVD focusing on gems and jewelry at the AGTA GemFair. 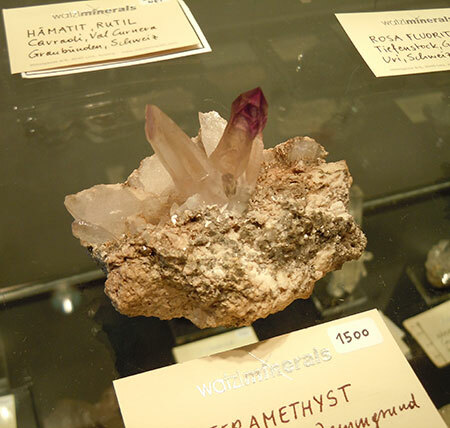 This month we feature a lavender fluorite from Peru and an epidote from Austria. This is a peculiar fluorite crystal composed of interlocking beveled cubes. It’s almost surreal to fumble this miniature mineralscape around in your hands. This is a true work of art from Mother Nature: a floater, almost complete all the way around, with only a few contact points. There are a couple of trace pyrite crystals on the back side. 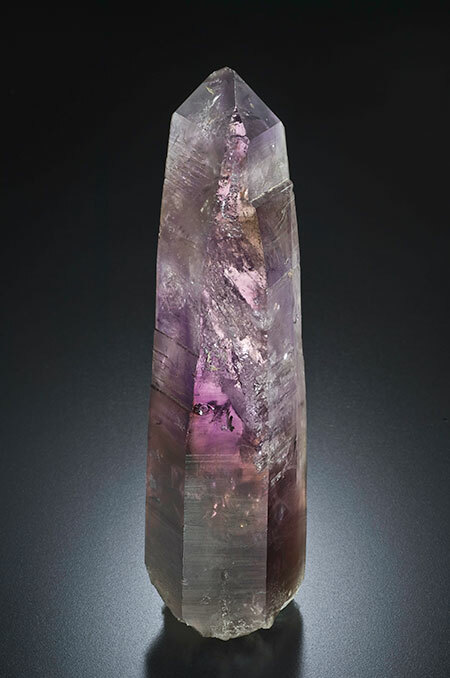 The specimen was found at the Huanzala Mine in Peru, which is known for fine specimens of fluorite and pyrite while production of lead and zinc can reach up to 1200 tons per day. The epidote comes to us from the historic Knappenwand Mine in Austria, on which we reported recently. Large fine epidotes are extremely rare from this locality, and the association of calcite and bissolite makes this piece one-of-a-kind. 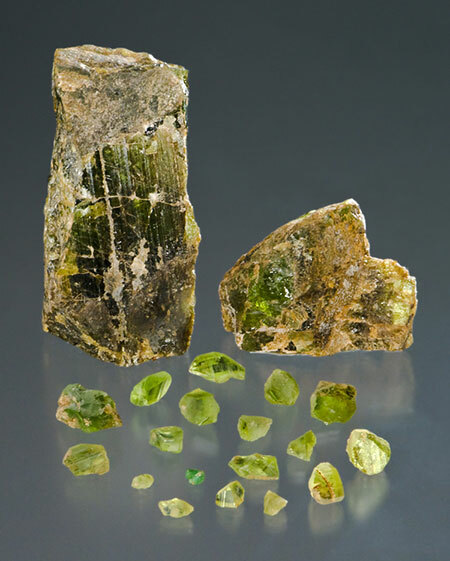 The geodesic-like calcite creates a solid foot for this long and complex epidote; then the sprinkling of bissolite adds to the character. 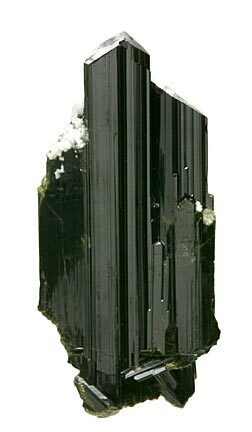 The main epidote crystal is striated and well formed with a curvature at the top and many intersecting, smaller epidote clusters. There are some contact points on the back, but it is very complete from the front. 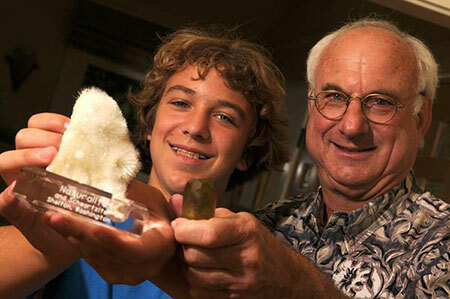 A superb matrix specimen from a classic locality. New Link. 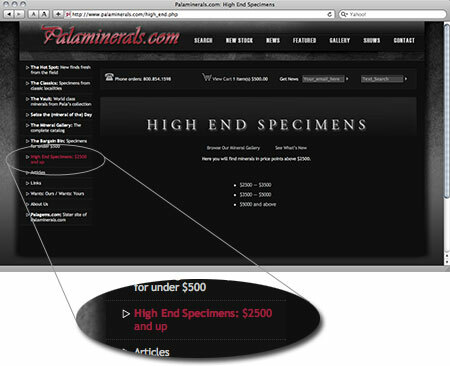 We’ve added a new category to Palaminerals.com—High End Specimens—with three subcategories to choose from. 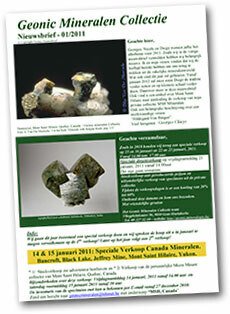 In our last issue of Pala Mineralis, we featured an abbreviated report from Pala’s Will Larson regarding the 2010 Euro-Mineral & Euro-Gem shows at Sainte-Marie-aux-Mines. 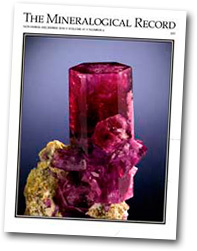 In his “What’s New in the Mineral World” column on The Mineralogical Record website, Thomas P. Moore mentions the Palaminerals.com website in general, and discusses in particular a uvite-dravite (aka tourmaline, pictured at right) from our catalog. 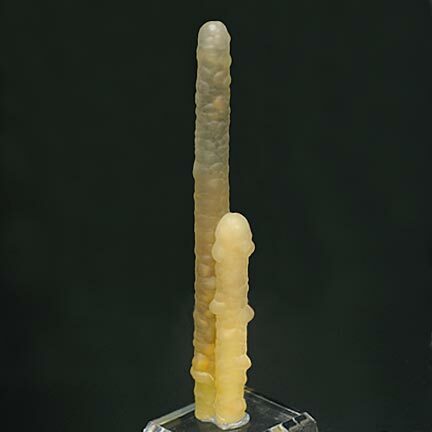 Recently, we added some chalcedony stalactites from Central Java to the online catalog at Palaminerals.com. 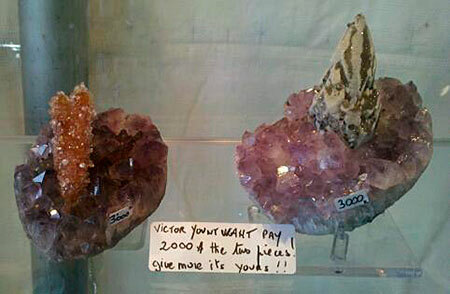 In the course of reviewing online information regarding these specimens, Pala’s John McLean came across a page about similar material on IndoAgate.com—the self-described “one man show” of entrepreneur Joel Ivey. After hearing about a discovery in Central Java of “clusters of agate tubes” in early 2009, Ivey decided to seek out the source of the material. 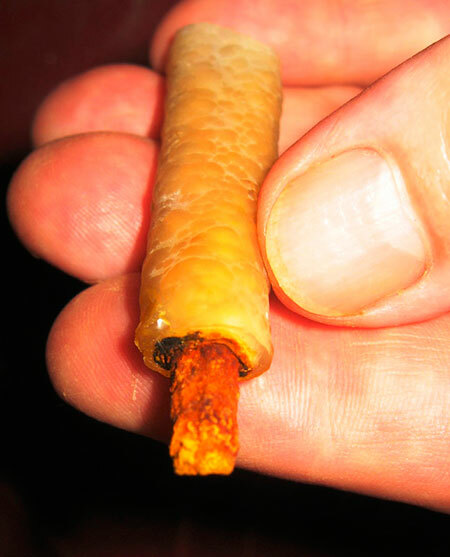 He describes what he found in Indonesian Fossil Bambu. Ivey told us last week that he was in the field with a paleobotanist, with the goal of identifying the original plant genus involved in the bamboo “fossils” and further defining “the genesis of the material.” He will update the above-referenced page accordingly later this month. 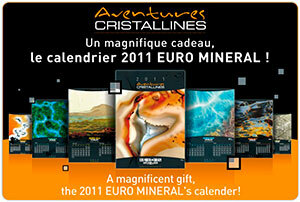 We received two notes last week about mineral sites from New York, NY and Lille, France. 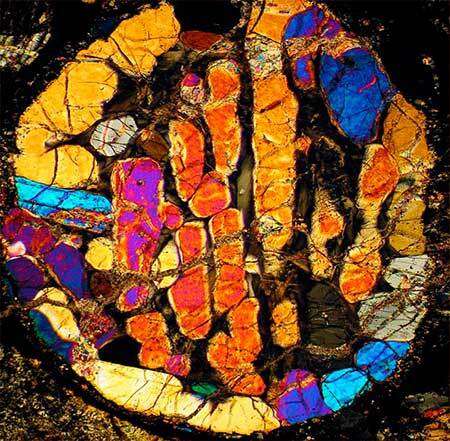 Frédéric Delporte, who collects French specimens and is “impassioned” about the mineralogy of France, is also impassioned about two French websites devoted to all aspects of earth sciences. 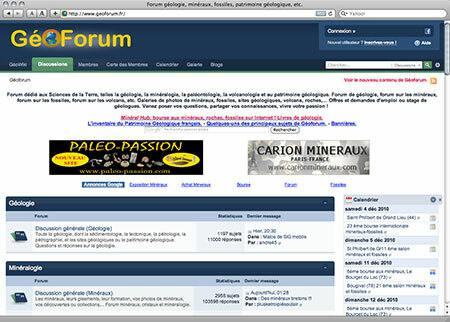 GéoForum is a space devoted to discussions of Earth Sciences, the Geological Heritage in the community life around the geology or geological events. The forum made 100,000 visits per month and 350 to 450,000 page views. Reference site in its field in France. GéoForum offers discussion opportunities in Geology, Mineralogy, Micromineralogy, Paleontology, and Vulcanology, as well as events, galleries, and more. Fun for francophones. Both these websites encourage participation as well as browsing. 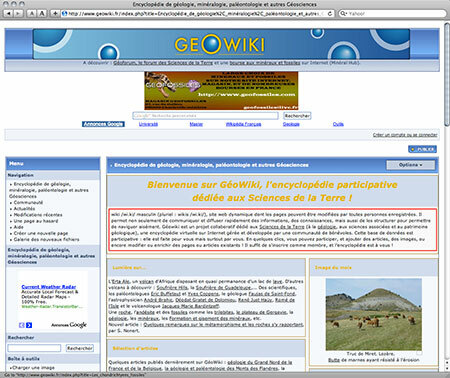 GéoWiki is an encyclopedia dedicated to geology, mineralogy, paleontology, volcanology and other Earth sciences. Everyone can enrich by registering as a member. 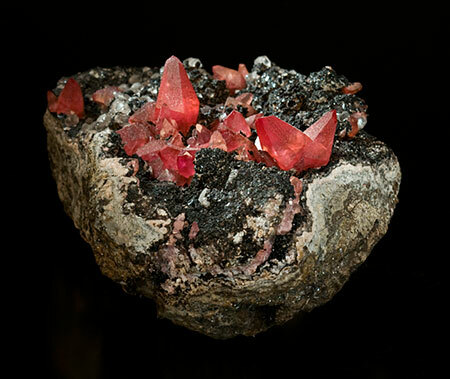 John Betts, a purveyor of fine minerals, pointed us to his non-commercial Mineral Museum—“strictly a reference site for collectors.” Betts told us that the virtual museum contains 67,000 images of 30,700 mineral specimens. 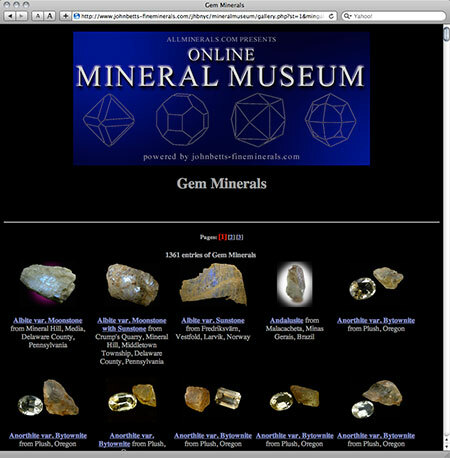 The home page gives an indication of the bounty: 734 “A” minerals alone are listed. Choose another letter of the alphabet and then choose your mineral. 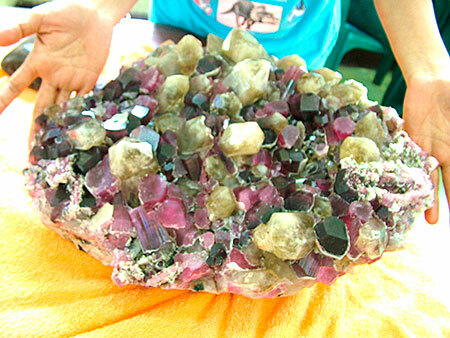 Gem Minerals. One of several pre-selected groupings that have been assembled for your browsing pleasure. 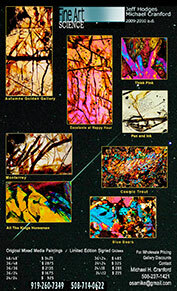 What Hodges collects and photographs, artist Michael H. Cranford renders in mixed media paintings combining photography and acrylic paint on canvas, according to the artist’s website. “Science and art collide,” he wrote to us before the 2009 show in Denver. Cranford’s day job is hardly down-to-earth: he designs tropical treehouses in Costa Rica (among other things). Click on the thumbnails above. 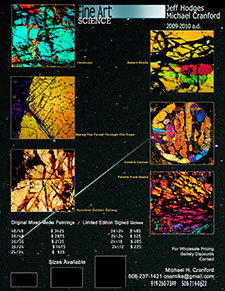 More information is available at The Meteorite Thin Section Gallery. Last month, in our gemstone newsletter, Palagems Reflective Index, we noted the testimony of Anthony Thomas, who claimed he was swindled out of possession of the 840-lb. “Bahia” Emerald after its true value was realized—a swindle aided and abetted by a man he considered a friend. Monday, the San Francisco Chronicle published a story titled “Bahia Emerald legal battle tears 2 friends apart.” It begins by questioning whether an item of commerce that destroyed a friendship might be cursed. 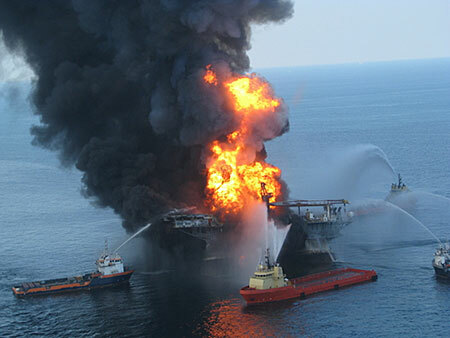 One of the lawyers involved, Eric Kitchen, demurred, calling the “Bahia” a “magnificent creation” of nature. If anything is jinxed, he said, it’s the attitude taken by mere mortals toward the stone. The trial is scheduled to resume December 14 in Los Angeles, according to a November 19 press release. “A trial date as to Mark Downie’s ownership claims to the Bahia Emerald has not yet been announced,” the release stated. As we noted before, the complicated case—which has had over 12 claimants, according to the Chronicle—is revealed by its title(s): Ken Conetto By Eric Kitchen His Attorney In Fact (Petitioner) vs. Kit Morrison and Todd Armstrong (Respondents); Mark Downie (Intervenors) vs. Eric Kitchen et al., Kit Morrison and Todd Armstrong (Respondents), Case No. BS118649. A longer version of this article appeared last month in our gemstone newsletter, Palagems Reflective Index. The topazos of the classical Greeks and Romans is the modern peridot, the transparent yellowish-green gem variety of the mineral olivine. Ancient writers said it came from the island of Ophiodes (Snaky) or Topazos in the Red Sea between Egypt and Arabia. 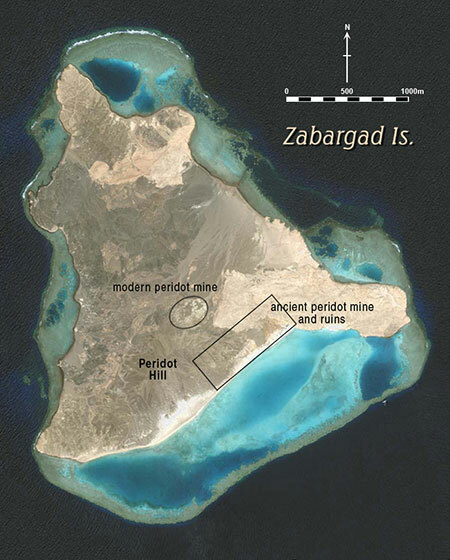 Today the island is called Zabargad, the Arabic word for peridot, and also sometimes Saint John’s. Commercial peridot and garnierite mining occurred there during the first half of the 20th century, but since then the island has been abandoned except for the occasional temporary military camp. Although much has been written about Zabargad’s unusual geology and modern workings, the ancient mine has not been reported until now. 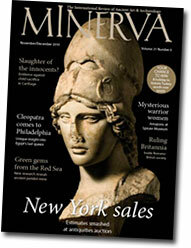 In an article appearing in the November/December issue of MINERVA magazine, James Harrell (University of Toledo, USA) and Elizabeth Bloxam (Monash University, Australia) provide the first description of the ancient mine. Located on the island’s southeast shore, the ancient mining site consists of roughly 150 surface pits, which individually are up to 20 m. across with adjacent spoil piles as high as 5 m. Also associated with the mine are the ruins of stone dwellings and a water well. Pottery fragments, which are especially common around the well, date mainly from the 3rd to 1st centuries BCE of the Hellenistic period with the rest extending into the Roman period. The following also appeared in last month’s edition of Palagems Reflective Index. 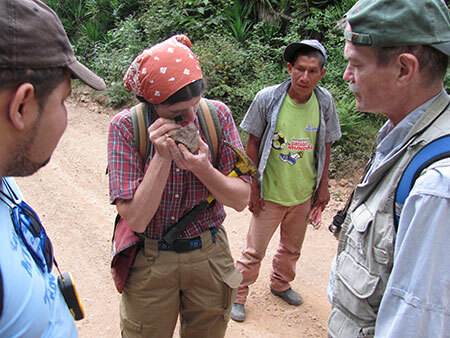 Dr. George Harlow, curator of gems and minerals at the American Museum of Natural History, has posted a two-part overview of his trip last month with the jaderos (jade researchers) of Guatemala in the Motagua Valley. The team of geologists were researching the origins of the area’s jade, which is a surviving legacy of prehistoric Mayan artistry. National Geographic Channel will air a new documentary about the “lost” crystal caves at Naica, Chihuahua, Mexico, twice on Thursday, October 14. (Check times here; be sure to set your time zone.) The two-hour program premiered last night, and from what we’ve seen, it deals with a multidisciplinary interest in the caves, from microbiology to space travel, beyond the danger, danger, danger tattoo that is the lure of such television programming. Naica’s famous selenite crystals were created in a stable environment of warm, mineral-rich water (as discussed in a 2006 Geology article), and discovered by accident as miners looked for lead, zinc, and silver. 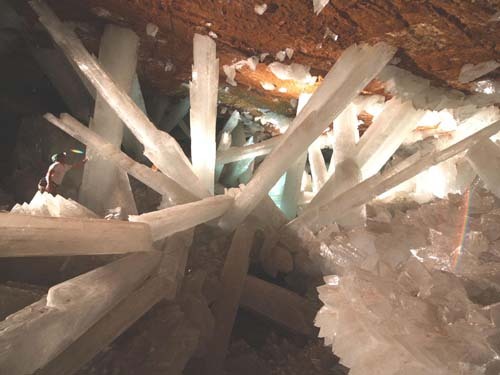 The crystals, now available for study as water has been removed from their caves, are the size of telephone poles, weighing up to 55 tons. (Other crystal caves, covered in the documentary, exhibit other features.) The caves are not hospitable, however, with their ambient temperature of 113°F and 90% humidity. Expeditions into the caves have been facilitated by the donning of “ice suits” and respirators that cool the skin, lungs, and eyes. Think “poached eggs” and you’ll have an idea of what five minutes of unmitigated cave exploration can do to the human body. The documentary, Into the Lost Crystal Caves, is a co-production of Canada and Mexico, distributed by National Geographic (NG). “For more than five years,” director Gonzalo Infante of Speleoresearch & Films “has tirelessly worked to share the wonders of Naica with the world and to preserve them for future generations,” a reference to the fact that the caves likely will not remain drained, as explained by Paul Williams, who visited one cave for another NG series. In this edition of Pala Mineralis we feature a remarkable specimen from the Hunza Valley of northern Pakistan, which in January suffered a landslide that created a threatening artificial lake. Pakistan is facing a tremendous challenge due to flooding. Please join gemologist Antoinette Matlins in her effort to hasten aid to Pakistan through her personal connections in the country. This photo may well have gone viral at the show in Denver two weeks ago. 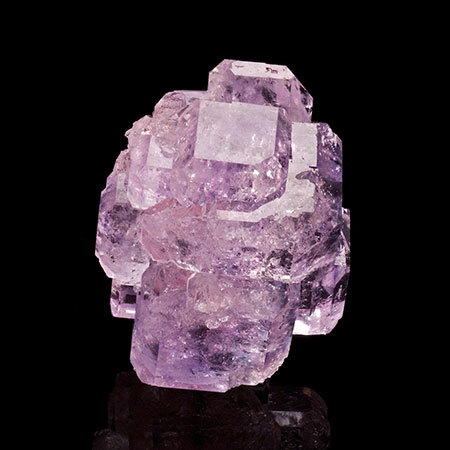 This month we feature a fluorite full of beauty. 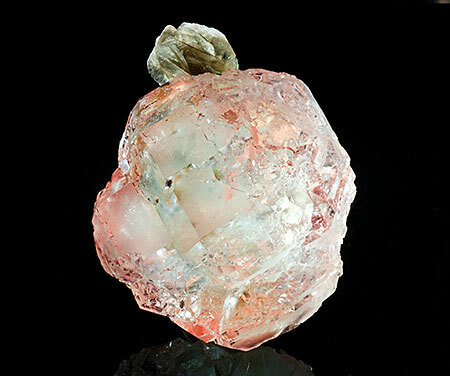 At first you notice the subtle pastel pink hue and then the complexity of the crystal formation. 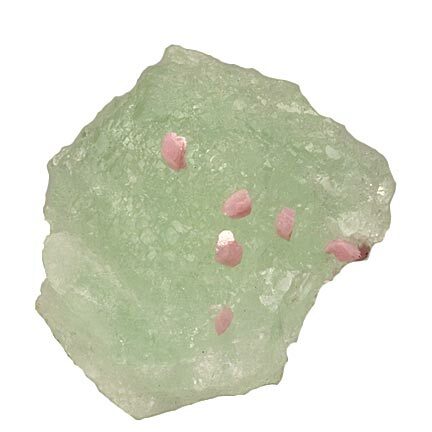 It’s like a big scoop of strawberry ice cream topped with a little muscovite flower. Frozen in time, this jewel glows with enticement and intrigue. 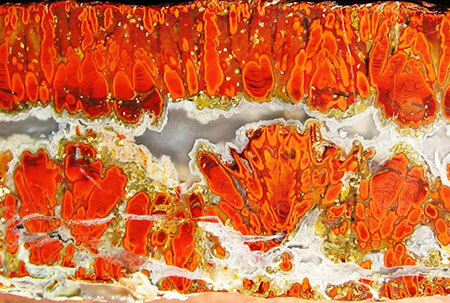 It’s a mix of glassy and frosted faces covering a gemmy core that plays with the light and creates a unique impression. This is one of the many specimens acquired at last month’s Denver show. 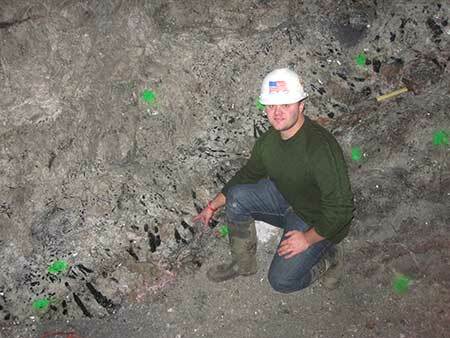 Will Larson points to black tourmalines at the Oceanview Mine last December. Today, the add-ons now available to users make this a very versatile resource. Due to the availability of hand-held Raman spectrometers, which use non-destructive technology, mineral collectors can compare their own data against the RRUFF Project database, which profiles thousands of samples. References are searchable via their own input form. Results returned usually include a PDF of the article, making this a useful virtual library, due to the collaboration of six mineral societies. Also accessible via RRUFF is the International Mineralogical Association’s Database of Mineral Properties, pictured below. This tool allows you to view the chemistry via four sources. Want to see the data on a given mineral from Mindat.org or Webmineral.com? Just click a button. Build your own mineral. 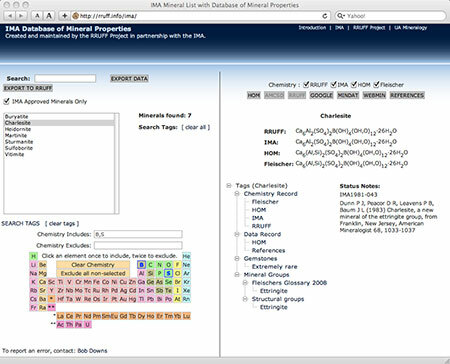 By selecting one or more elements in the periodic table at left you can filter the list of 4,400+ minerals that displays above the table. Finally, the case of the 840-lb. 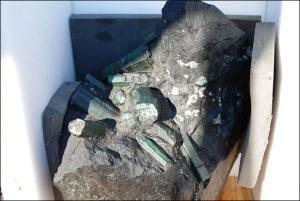 “Bahia” Emerald is proceeding in Los Angeles. Claiming to be the specimen’s first buyer, Anthony Thomas, spent several hours on the stand, and said he bought it in 2001 for $60,000 not long after it was mined in Bahia, Brazil. According to Thomas, the money he wired to the Brazilian owners never arrived. 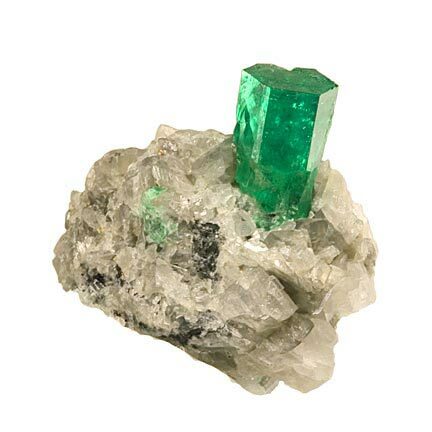 Even though he traveled to Brazil, technically Thomas seems not to have taken physical possession of the emerald, supposedly returning to the U.S. for a family emergency without crating the rock and then losing the bill of sale in a 2006 fire. Other claimants had their own take on the sequence of events, as reported in a September 24 Associated Press story that was carried by media from the Los Angeles Times to Huffington Post to The Guardian (UK). A September 30 press release stated that the bench trial will continue on October 26. Another claimant, Mark Downie, will have his case heard separately on a date to be announced. 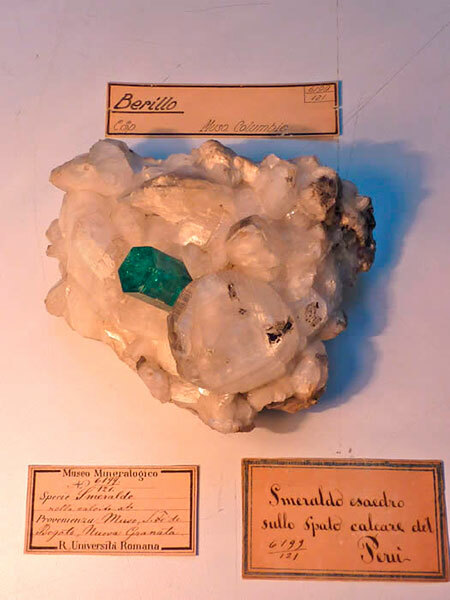 Ronald Ringsrud, author of Emeralds, A Passionate Guide, spent time in Italy not long ago, and discovered a lovely specimen, pictured below, in the Mineralogical Museum at the University of Rome. In his recent e-newsletter, Ringsrud explains why the tag lists the origin as Peru, rather than Colombia. 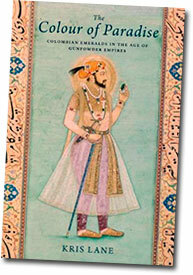 Ringsrud also points to another book on emerald, published last spring, Colour of Paradise: The Emerald in the Age of Gunpowder Empires, by Kris Lane, professor of history at the College of William and Mary. A two-inch-square emerald, so dark it blocked the sun, was plucked from the ground a year ago August at a farm near Hiddenite, North Carolina, by Terry Ledford, a business partner of Renn Adams, who owns the farm with his siblings. 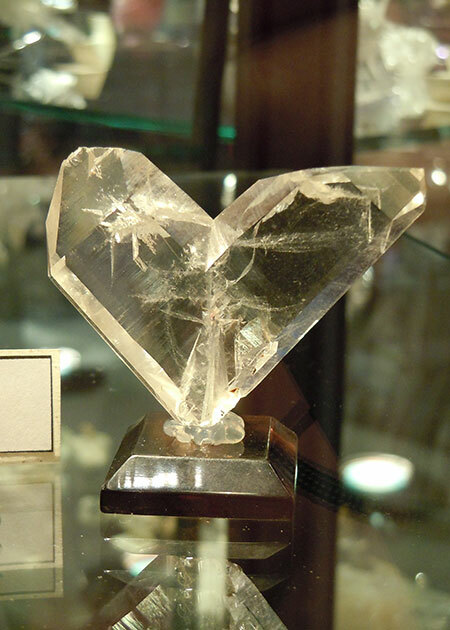 (Yes, the town, which lies in the western part of the state, 50 miles northwest of Charlotte, is named for the mineral hiddenite, a variety of spodumene.) Since then the stone has been cut and re-cut, now weighing about 65 carats—about a fifth of the crystal’s original weight, according to an August 30 story by Associated Press. Ledford told the Charlotte Observer that the crystal was so big it looked like a 7 Up bottle, weighing 310 carats before being cut. The story also describes the mining method employed by Ledford and Adams. Coincidentally, we were sent photographs of this overwhelming item, courtesy Kyaw Thu. The late Mel Fisher left a collection of artifacts, from his famous treasure hunting, to the Maritime Heritage Museum named for him in Key West. On August 18, perhaps the single most memorable article in the museum was lifted—and then lifted. For 25 years, a hands-on exhibit has allowed goers to do a dumbbell curl with a $550,000 gold bar, from within a specially designed display case, until it was stolen on the 18th. 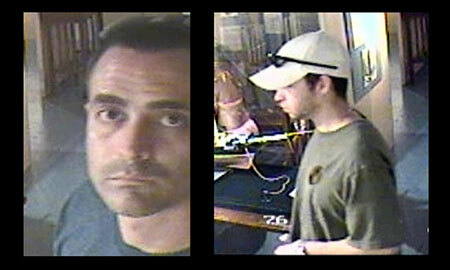 Video of the still-at-large suspects is on YouTube. Would you mind stepping up a little closer? Suspects were not shy about letting security cameras get a good look. CA to drop state rock? 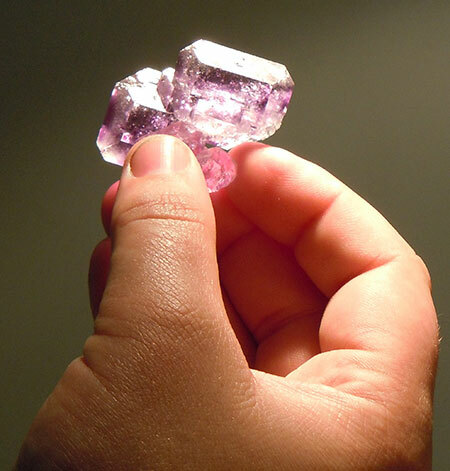 Bill also will speak on Saturday, August 14, at 1:00 p.m., on the topic of “Mining, Minerals & Gems from The Legendary Valley of Rubies, Mogok, Burma.” Other speakers this year are Bob Jones, Nancy Millard, and Kevin Downey. Nearly 200 dealers, designers, lapidaries, and publishers from the U.S. and abroad will be featured at the show. 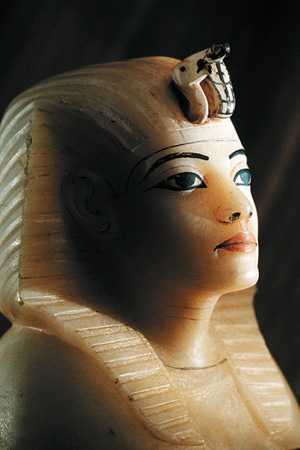 …you have a chance to see Tutankhamun: The Golden King and the Great Pharaohs at the Denver Art Museum, which includes 50 artifacts from the tomb of this 14th century C.E. son of a heretic, such as the canopic stopper at right carved in the young king’s (or another’s?) likeness from translucent calcite, and used to seal canopic chest compartments containing his internal organs. 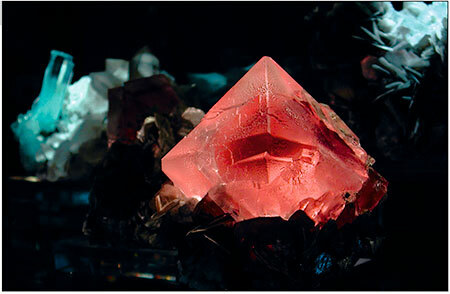 The rhodochrosite comes to us from the Uchucchacua Mine in the Oyon province, Lima Department in Peru. Clusters of intense orangey-red rhodochrosite scalenohedron crystals mixed with tiny fluorite crystals are scattered on a black gritty matrix. 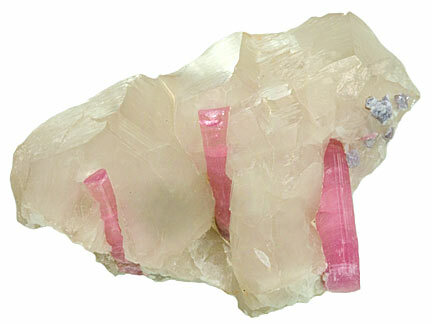 It features several pristine rhodochrosite crystals around 1 cm. in length and a twin perched right on the edge of the specimen. 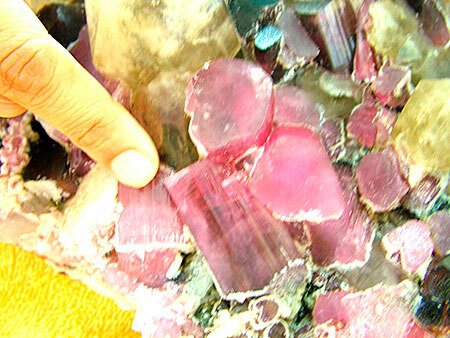 The phenakite come to us from Kat Chay Mine, Momeik, Mogok, Sagaing District, Mandalay Division, Burma. 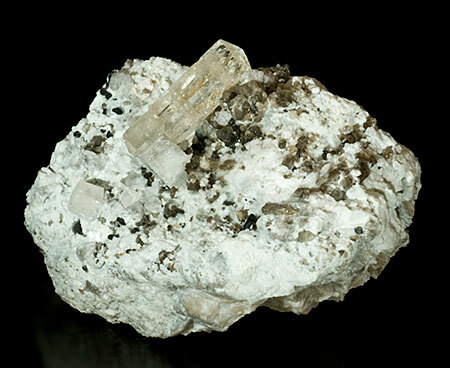 A doubly terminated phenakite crystal is positioned amongst a salt-and-pepper matrix of feldspar and quartz. 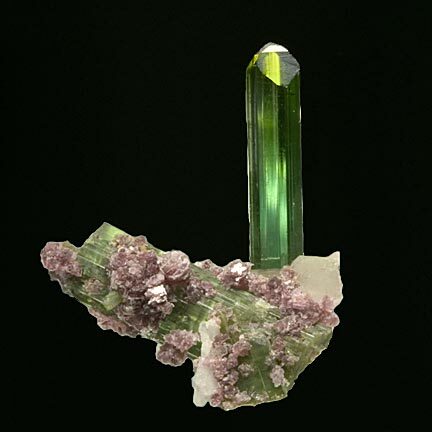 The phenakite crystal is 3.7 x 1.2 x 1.0 cm. and very gemmy with a glassy drill bit termination. 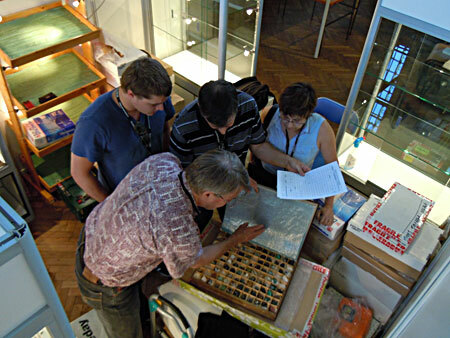 Visitors to the Pala International websites by now are familiar with how a love of fine mineral specimens can be passed from the older generation to the younger. But what of the reverse? That’s the case with Max Sigerman and his father, Jon, as presented in a July 5 article in the Marin Independent Journal. 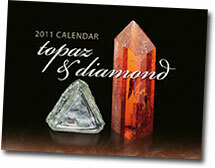 Also featured in the calendar is a topaz group from Pakistan’s Shigar Valley, from Bill Larson’s collection. See the calendar at the East Coast Show, or visit the Lithographie website. The article tells how Max got bitten by the bug Culicidae cobbingia—and why his father went along with it. 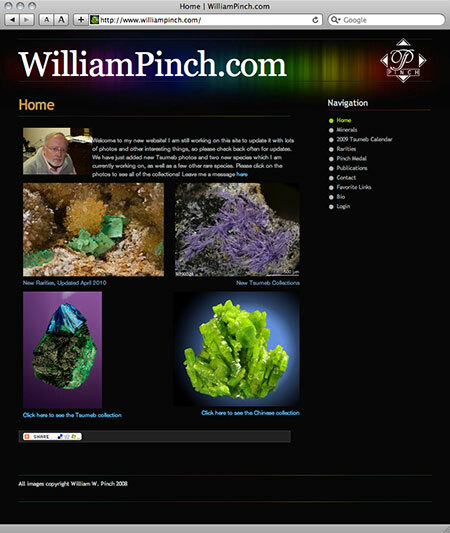 William Pinch has collected minerals for more than fifty years. I’ve had the pleasure of doing business with him and spending time gaining knowledge from him at the many mineral shows we both attend. His website, WilliamPinch.com, contains an allotment of beautiful photographs of specimens from the William Pinch collection. 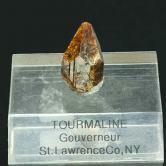 This includes a comprehensive locality collection from Tsumeb, a Chinese mineral collection, and a Rarities section. The website is very well laid out and the photographs are beautiful; so I highly recommend any mineral enthusiast to check it out! The Tsumeb collection has three sections and contains many rare species I’ve never seen in person from this locality, as well as the more common species, all of which are beautiful. One of my favorites is in Tsumeb Gallery 1, the second image, of the luscious velvet blue azurite crystal. It jumps right off the screen as if you were holding it in person. But don’t stop there; continue to browse, as there are many beautiful things in Galleries 2 and 3 of the Tsumeb collection. The next collection is the Chinese mineral collection, which covers a wide range of minerals from all over the country. One of my favorite pieces is a group of spiky electric green crystals of antlerite with brochantite. This Chinese mineral collection can really give you a great idea of the many different species that come from all over China. The Rarities collection contains few specimens, but these are some of the rarest minerals in the world, most of which I’ve never heard of or seen before. Pala is truly “International” when we have visitors to Palaminerals.com from across the pond. One eagle-eyed reader, our Austrian friend Nikolaus Lackner, noticed a locality contradiction in one of our epidote offerings from his part of the world. (We had inadvertently placed Knappenwand in Tyrol instead of Salzburg.) 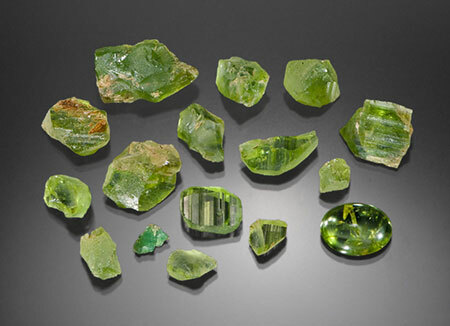 Nikolaus, who is concentrating on mining for emeralds, is intimately familiar with Knappenwand, and last month had just returned from a 16-day mining trip to the area. 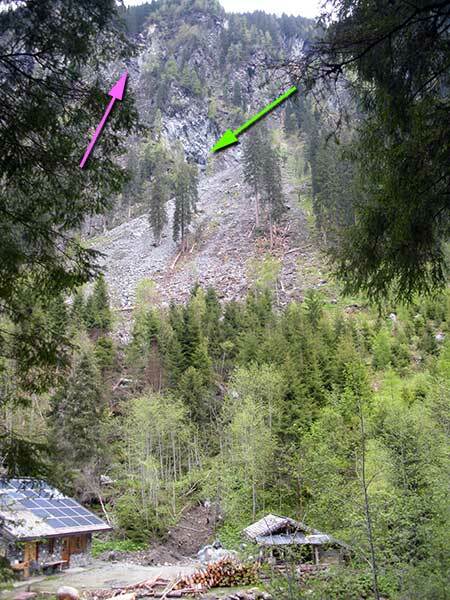 This spring there has been a gigantic rockslide in the Untersulzbach Valley. Really gigantic! 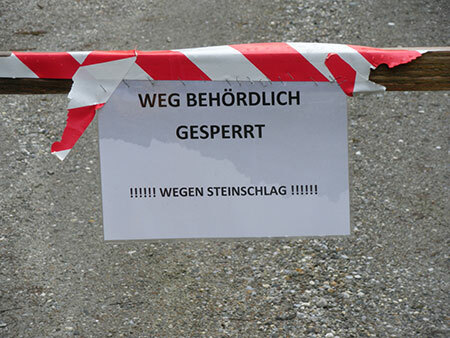 The whole valley is closed (no entry allowed at all) since 22. of April. The actual mining site itself, as it is in a half-cave-like pocket, is not destroyed, but can’t be worked, and, can’t be accessed. The street is gone and geologists doubt that the street will ever be built up again. The rubble—with boulders as big as mansions—spreads for miles, even blocks another mine, the Schaubergwerk Hochfeld. Nikolaus went on to say that the situation is even sadder for the rockhounds than for the dealers. 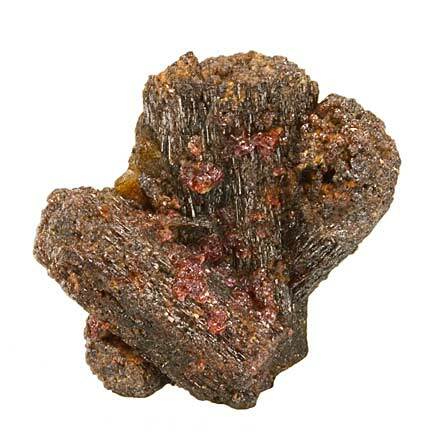 Uncontrolled blasts from illegal mining during the 20th century blew many crystals into the forest floor below the mine, allowing for nice specimens to be found by Nikolaus and his fellow scouts. “Now that forest is gone,” he told us, due to the landslide. 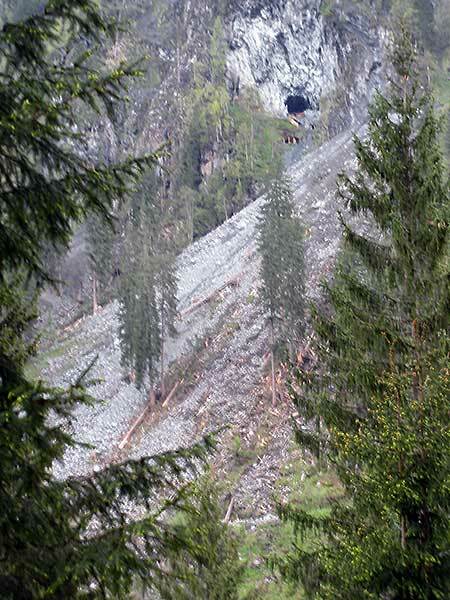 He kindly obtained from Peter Rieder the photographs that show the extent of the landslide’s impact. 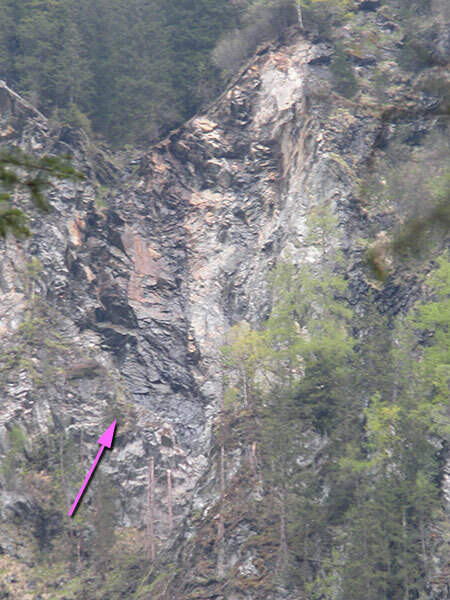 According to an April 22 story in the Salzburger Nachtrichten (no longer available, but copied on Forum Gipfeltreffen), the Untersulzbachtal Valley was accessible only by a footpath; even so, a restraining order was in effect. 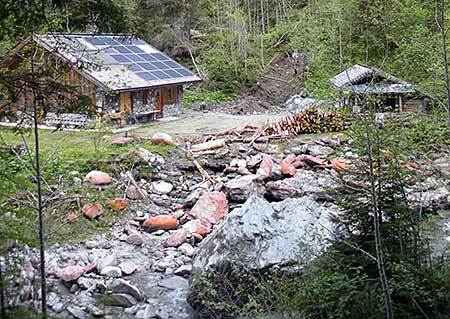 The story stated that a January landslide had fallen all the way to the valley trail and hut, with the hut barely escaping demolition by a large boulder. 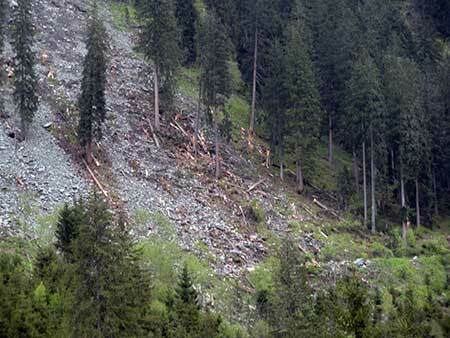 The landslide had the potential of disrupting not only specimen-scouting, but also the movement of cattle via alpine trails, the story said. 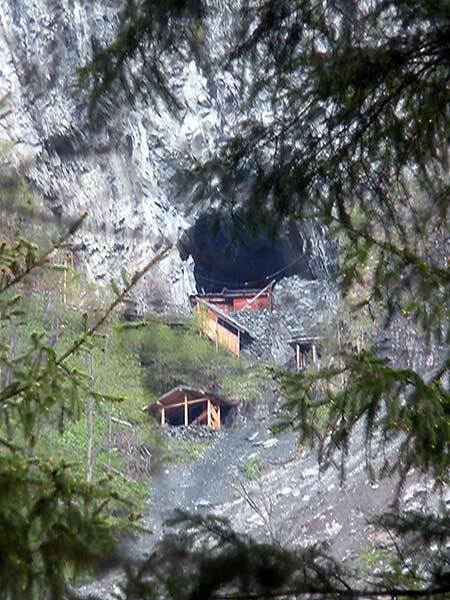 Until the disaster, the Knappenwand (literally “miners’ wall”) mine was open for visiting during summer months. 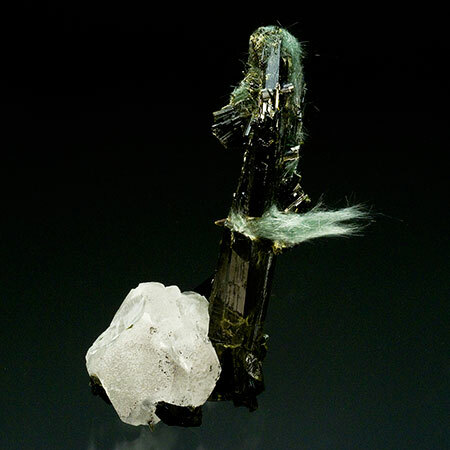 For more information on the mine from Nikolaus Lackner, as well as some stunning epidote photographs from the Naturhistorisches Museum Wien, see his entry on GemologyOnline. 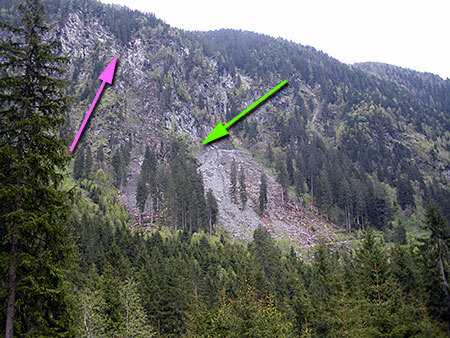 Above: The pink arrow points to a slide area enlarged below. The green arrow, again, indicates the entrance to the Knappenwand mine. Click for enlargement. For an amazing photograph of the wintry mine entrance, and showing the green epidote-bearing ore that surrounds it, see Lapis.de. The photo caption there states that the mine’s aerial ropeway and outhouse were destroyed, but the mine itself was spared. BlueCap Productions: What’s Hot In Tucson 2010 is now available. Co-hosts David Wilber and Bob Jones take you through the shows in the course of three DVDs. 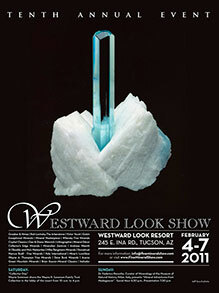 Included is an interview with Will Larson, who was the featured exhibitor at Westward Look. In July’s Palagems Reflective Index we looked at a feature story in the Spring 2010 of InColor, the quarterly issued by the International Colored Stone Association (ICA). 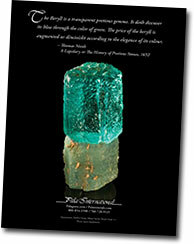 It surrounds the story and collection of Edward A. Metzger, a connoisseur collector of colored stones. Pala’s Bill Larson is slated to contribute the foreword to the upcoming book about the collection. 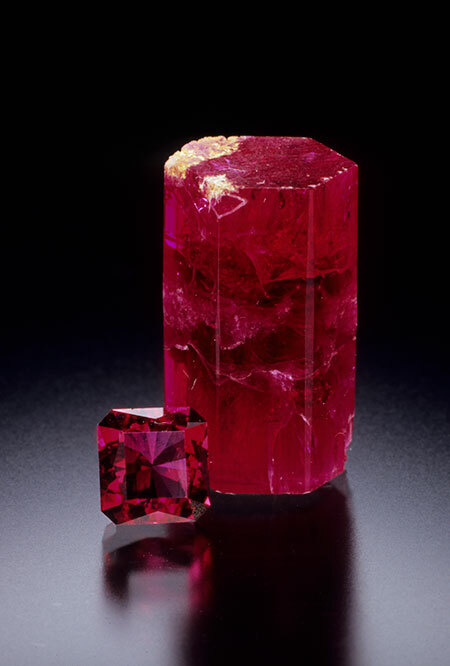 When I first came across the nearly euhedral red beryl crystal and its flawless faceted counterpart, not only did I immediately think of Jeff's signature rough-and-cut style, but also how to tie this collection into our academic focus. 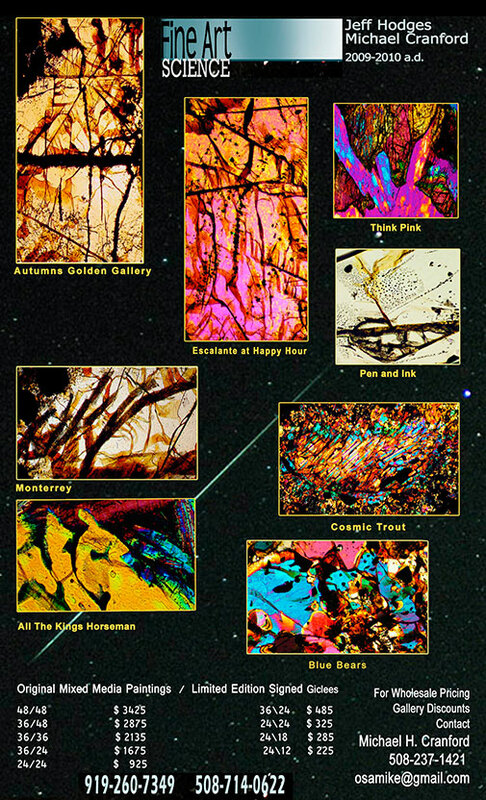 Jeff’s knowledge of mineralogy along with his skill at capturing the special qualities of gems and minerals has made this collection come alive in print, as the InColor article demonstrates.